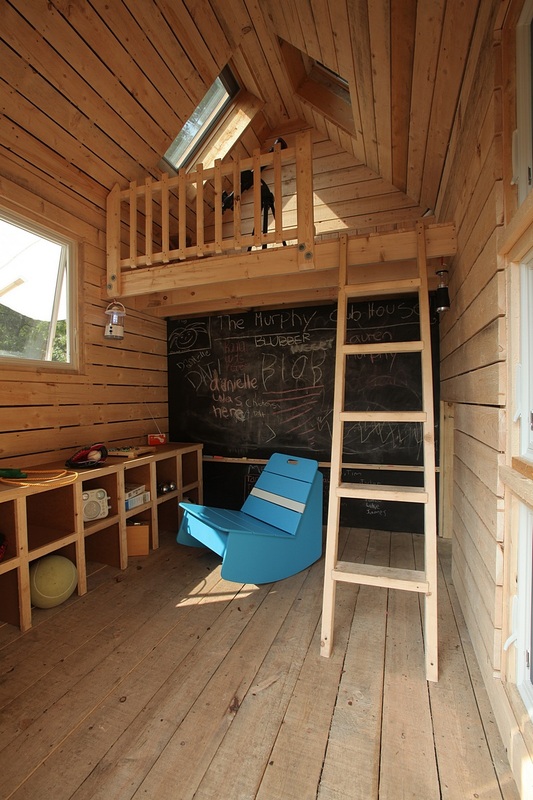 A sustainable playhouse house for a great cause. FUNDRAISER. This playhouse provides a true retreat for kids, encouraging them to play outside and stay in touch with nature. Designed as part of a larger fundraising effort for the Housing Assistance Corporation, a lucky family purchased two playhouse raffle tickets. Those tickets not only won the playhouse, but also helped to raise over $50,000 for Cape Cod Kids who receive services through emergency shelters and housing programs. GREEN & FUN. Responsible green features make the playhouse good for the family and the environment. The structure is clad inside and out with rough-sawn spruce boards, which are naturally weather resistant. Rainwater is captured through integral roof gutters to be deposited in a catchment barrel. The attached succulent and herb garden can then be watered using the rainbarrel spigot. An outdoor chaise for one or two provides a spot to relax, and is movable to follow the sun. A reclaimed sail has been repurposed to provide shade for the large south facing window in the summer. When opened, windows on both sides capture passing breezes and allow for passive cooling. One gable end of the playhouse features hidden double storage shelves for toys and balls. The other gable end includes a climbing wall, recycled tires for a soft falling surface, and a hidden door that leads inside. Storage cubbies offer easy access spaces for toys and games, while a chalkboard encourages drawing and writing. Crank lights and a crank radio use kid power to operate. The blue racer rocker, made of recycled milk bottles, offers fun yet durable seating. In the corner, a kid-height sliding side door guarantees an easy second exit at all times. A ladder leads to the second floor loft area. Twin skylights provide daylighting and the ability to follow the evening stars with the telescope. SUCCESS. Overall, the combination of fun for the winning family, environmental sensitivity, and funds raised for the Housing Assistance Corporation of Cape Cod made this playhouse a success on many levels.